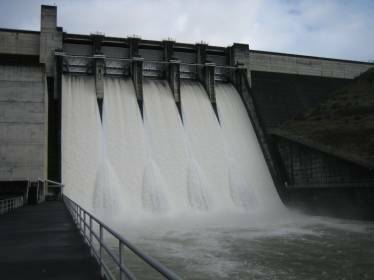 Located on the middle fork of the Willamette River in western Oregon, Lookout Point Dam and Fall Creek Dam were both built by the US Army Corps of Engineers as part of the Willamette Valley Project. Originally completed in 1954 and 1966, respectively; both dams were scheduled for restoration work by the Corps in 2010. Both projects focused on rehabilitation and replacement of the hardware and connection components relating to the operation of the spillway gates. Both jobs were time critical, fast track projects, as all work had to be completed during the limited window of time during which the reservoirs behind the dams were drawn down to lower levels. When the contractor who was awarded the projects needed to domestic A449 galvanized rods and stainless steel fasteners for the restoration, they trusted Portland Bolt with their time critical order. Portland Bolt was able to manufacture and deliver 1” galvanized A449 fully threaded rods, as well as stainless steel threaded rods and A325 structural bolt assemblies on a tight production schedule to meet the contractor’s delivery needs. Our in-house hot dip galvanizing line and our years of experience in supplying fully domestic governmental and highway projects allowed us to meet the contractor’s critical delivery dates and keep the project on schedule.